Hash/Hash Browns come in all manner of forms. Whether grated, cubed, diced, smashed or lovingly formed into a crisp rounded triangle for the freezer, I love them all. Potatoes are a superfood – not in the irritating East London “blueberries are a superfood” way. In the way that they are just…so damn good. Technically a hash is just a dish of hashed (derived from the french word to hack or chop) potatoes that are pan fried, usually with some onions and other additions. It makes a lovely weekend brunch in this sense, as you can use up anything you have lying around but still have that hot breakfast charm. This particular hash is very vaguely inspired by Middle-Eastern flavours. The amounts are VERY much down to taste and the size of your pan. Chop and prep how much you would like to eat, it’s your hash! Dice your potato and boil for 7 minutes or so until fairly soft. Make sure you salt the water well! Pat your potato dry and add to a skillet of hot oil, frying evenly on a medium-high temperature until beginning to crisp. Set your petit pois to boil so they are soft for later. Add the pepper and onion and fry for a further few minutes until beginning to soften. Add the garlic and curry powder, and fry for another minute before adding the peas and chickpeas. Serve topped with a poached egg and a drizzling of cool tahini. 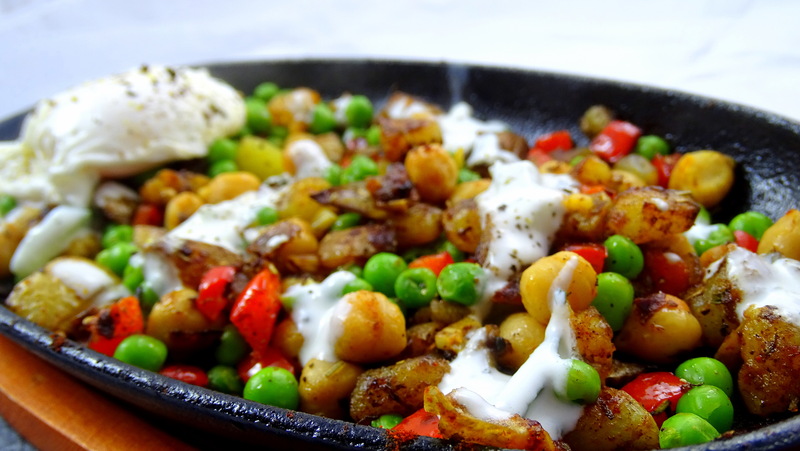 Posted in Guesscipes, Mains, One Pot, VegetarianTagged Best, breakfast, brunch, chickpea, food, guesscipe, hash, hash brown, middle eastern, potato, recipe, tahini, Vegetarian, weekendBookmark the permalink.